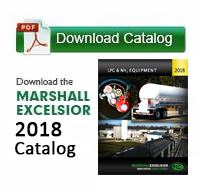 For over 42 years Marshall Excelsior Company has been a progressive manufacturer of top quality and competitively priced LPG & NH3 equipment that is leading the industry in innovation and low emission products. We offer a full range of products that support the LPG & NH3 Bulk Plant, Transport, Delivery/Dispensing, and Domestic applications. As our product line continues to grow, we are striving to improve product functionality while taking the industry standards to a higher level of quality and performance without adding excessive cost. While following along this path, our engineering staff exercises a heavy reliance on the input from our customers throughout any new product design phase. It has been through these theories and approaches that we have been able to carve out our niche in an industry where safety and performance must work hand-in-hand. Our goal is to create the safest equipment solutions for everyday operations while allowing the largest amount of product to be transferred, dispensed, or otherwise used, resulting in an overall savings to the customer. In addition to our company philosophy for new product development, you will find our approach to daily operations equally unique. In a time where materials, fuels, and other manufacturing costs are on the rise, we have not only remained competitive, but one of the industry leaders in on-time deliveries and short lead-times. The reason is simple; we not only manufacture our products effectively, but carry one of the most extensive on-hand inventories available in the industry. This allows our distributors to react quickly without having an excessive amount of stock on hand. Put this together with our proactive, responsive sales and customer service staff and you have a winning combination. As one of the industry leaders in responsiveness it is essential for our organization to be able to react in a rapid fashion, hence our fully integrated manufacturing and purchasing process. Our capabilities in manufacturing range from high volume to custom made product. Both of which are supported by our wide variety of manufacturing equipment, highly skilled personnel, and dedicated purchasing staff. Combine these attributes with our top notch ISO9001 quality system and you have a combination that easily rivals that of our nearest competition. Over the course of time Marshall Excelsior Company has become a name that our customers can rely on not only for high quality products and services, but as a partner in building their business. Together, with our commitment to the industries served and our eagerness to improve and expand our product-line our customers routinely find the opportunity to promote our organization. It is through this personal touch that our family owned and operated business has become the organization that it is today. We are confident that as our company continues to develop and mature in our industries, Marshall Excelsior Company will become a brand of choice. © 2008-2019 Marshall Excelsior Company All Rights Reserved.